Ron McFarlain founded the Cajun Connection in 1995. He started out as a small restaurant with a few tables. The early days of his business were primarily spent educating guests on Cajun foods, giving away lots of gator to skeptical patrons, and perfecting his light Cajun batter. As time went on, word spread about the quality of the food and his boisterous personality. In 1997, Amy (Martin) McFarlain, joined Ron in operating the business. By 2001, the Cajun Connection no longer had to give away gator for patrons to give it a try and had outgrown it’s humble beginnings and moved down the road to it’s current location. 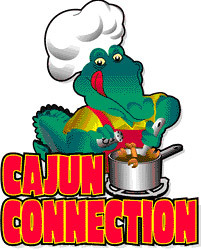 The Cajun Connection features many recipes from Ron’s family. He was raised in the swamps near Lake Charles, Louisiana. His family instilled a love for home cooking. Anything the family hunted from the swamps, was brought home and cooked for the family. This “swamp to table” mentality has stayed with Ron. Every dish that is served to our guests, has been given the attention Ron would give to anything cooked for his family. Amy and Ron strive to provide the most authentic Cajun experience possible. From our Boudin to our Red Beans and Rice, we can “Guaarantteee” it will be authentic Cajun.